Games4King - G4K Farmer Escape From Forest House is another point and click escape game developed by Games 4 King. There were a few houses in a beautiful and magnificent forest. The place was beautiful to see. One farmer lives in that forest. The farmer was unexpectedly stuck in the house there for a day. It is your duty to save the farmer from there who is in the house. It will help you find the hidden clues to save the farmer. 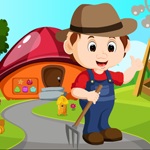 Find all the clues and the farmer rescued from the jungle and congratulate you to win the game. This game is highly desirable. Good luck and have a fun! I am stuck so Dazz did not say EVERYTHING I must know. POP, finally found the last easter egg and it was easy from there. Thanks for all the help Dazz!